This outfit was an opportunity for me to wear so many of my favorite things, all at the same time! This blazer is essentially a cozy sweatshirt masquerading as a structured blazer. The bubble necklace I bought almost 2 years ago when they were still new and fresh at J Crew. The green top is silky but has just a hint of stretch, and who could forget the J Crew favorite, Minnie pants! Also, my new studded flats that I bought in 2 colors I love them so much! So many great pieces I could never pick a favorite. I had to cancel my hair appointment so I still have time to make a decision on what to do with this red mop. Still open to suggestions cut and color wise! I'd appreciate the ideas! Some very observant 10-year-old students asked me today why my shoes are always so pointy! Kids these days, they just don't get fashion! Have you considered growing it out? You seemed to like mine when it was long. I always think it's kind of fun to go back and forth... very dramatic when you finally cut it. My hair pretty much wont grow longer than like 2 inches past my shoulders! I I would if I could have a crazy long mane! I would love to see you hair the color and length it was when you and Andrew got married! If only hit would grow. I have cut in mind but it will take some time.If only i believed in hair extensions... When Andrew and I got married I'd say I had a good 6 more inches of hair, but I swear to you the color is still exactly the same! I still do it myself! Does the color look different? love the blazer :) and great statement necklace! Just the sight of the name of your blog is making me want to run down the street to Starbucks! Thanks for stopping by HotPINK! Thanks, Might be why I had to buy them in two colors! 1. I re-tried on the Forever blazer (not that one, the OTHER sailor-y one with the shoulder pads) and still couldn't deal with the stripes not matching up. Sigh. 2. Now I'm ordering 2 bubble necklaces. 3. I'm thinking DARK brown, with a more angled cut (like, short in the back, but only a little). Or, if you want to get crazy, what do you think about an asymmetrical cut!??!?! I want to do it, but I'm not ready for a chop yet! I also have half a mind to go Kelly Osbourne purple/grey. HALF. 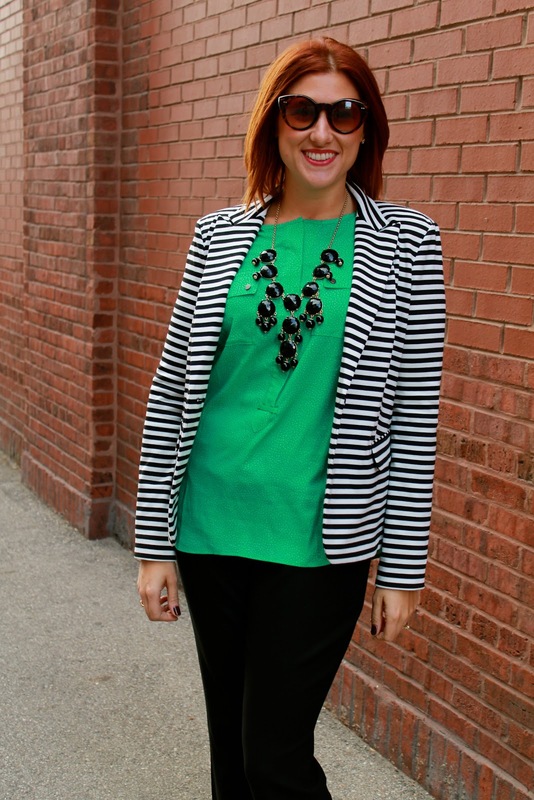 absolutely love that striped blazer! so cute! Thanks! It's totally my new favorite! Fall Shoe Favorites All under $70!